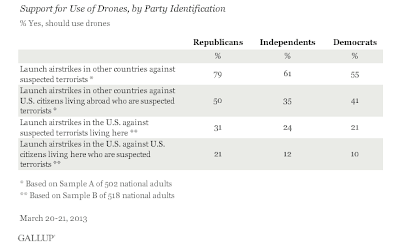 Irtiqa: Gallup: Drones on others are fine - but not on us! 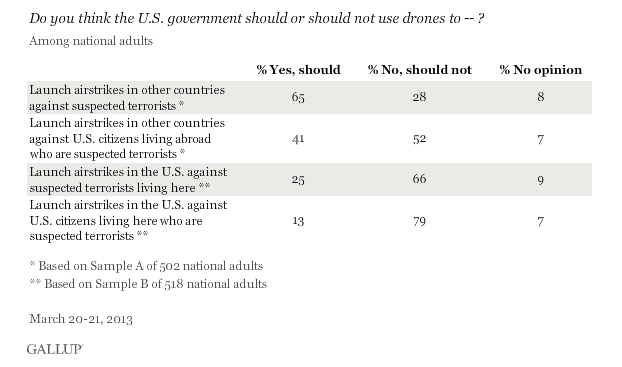 In my opinion, comparing the use of drones in other countries (like Pakistan) and US is not really fair coz in the US it’s a lot easier to hunt down terrorists on the ground by FBI & police with little chances of losses by FBI than say doing the same in FATA which is essentially a war zone and a hub of terrorists. 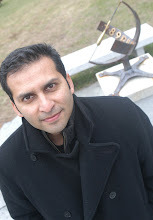 Using drones in Pakistan is a sensitive and debatable topic; it has advantages in that it is an effective way of eliminating wanted terrorists (and thus limiting future terrorist activities) in a difficult and terrorist-infiltratred terrain where the Pak Forces are either unable or unwilling to go. Also all of FATA and adjoining Afghan border regions are hardly under the control of Pakistan Govt and where even Pakistan laws don’t apply. Downsides being that there is considerable collateral damage (up to 1/3rd victims are innocent children & women) and that it creates an experience of humiliation for the innocent survivors that breeds more contempt against US and a desire to seek revenge, hence joining the ranks of TTP is a real possibility. There are counter arguments to the “downsides” too, that TTP use women/children as shields and the victims’ families and tribal elders actually provide refuge to terrorists. There have been several attempts at appeasement, peace & negotiations and with TTP but they simply haven’t worked; TTP perceives any attempt at negotiation as a strengthening of its own position and doesn’t even recognize the Pak govt. It’s a very complicated situation, blame also lies with both US (for being a arrogant and thinking that the only solution is a military one) and Pakistan (for still hanging on its “Strategic Depth” policy and not doing enough to control extremism being promulgated from madaris and mosques). While the drone strategy works to an extent but attempts at negotiations shouldn’t be ruled out as it’s clear that there’s no military solution. There are no short-term solutions to problems of extremism that took a couple of decades to cook and bear fruits. From a Pakistan perspective there has to be a clear realization that extremism now poses a grave threat to the country and both the Govt & Army need to work towards a long-term solution, one that should include halting this slide towards extremism/intolerance by regulating madaris and curbing power of mullahs and undertaking a major overhaul of the GHQ-driven foreign policy vis-à-vis interference and exporting militancy in Afghanistan, Kashmir. Amazing how Fox News gets away with blatant Islamophobia and no one bats an eye; Jon Stewart was brilliant as always in exposing these people…. The eye-opening NYT adds more evidence as to how the influence of CIA has grown as the war has gone on with no end or solution in sight, certainly there’s more need for diplomacy. 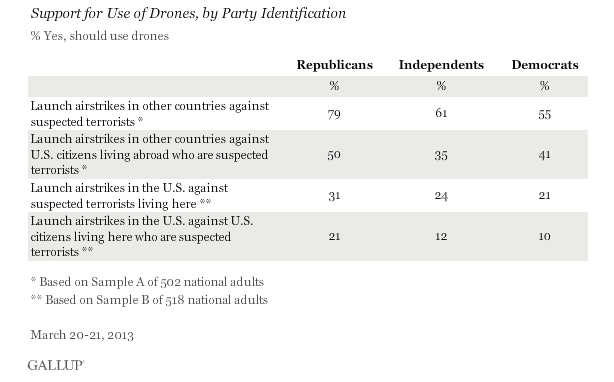 But this is a question of how American see the drone strikes. The question is not about "when terrorists are inaccessible via traditional means". The strikes are taking place outside Pakistan as well (for example Yemen) - and the "suspected terrorists" are often defined as any male of military age. 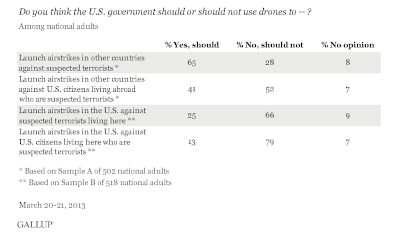 The Gallup poll is more about the way Americans see what ought to be allowed or not. And this is all independent of the assessment of the overall assessment of the effectiveness of the drone campaign - which has been winning battles but losing the war. And yes - Fox News is just vile. The scary part is that a lot of people watch it and are exposed to those crazy assertions! I was coming from a Pakistan point of view, and factored in “ when terrorists are inaccessible via traditional means” thing in the poll question. Often dismissed as left-wing conspiracy, but it should be cause of concern in the US that the “military-industrail complex” (includes defense contractors and corporations such as Lockheed, Boeing, GE etc. which Eisenhower termed as a threat to the democratic govt in his farewell address in 1961) is reaping the most benefit from the drone campaign and the trillion dollar US military budget spending, when some of those funds can be better spent on healthcare, infrastructure and education, science. Not to mention the influence these corporations yield on members of Congress via political contributions, surely they want something in return too.